This week I’m going to talk about Maiella, a vast tableland on the eastern side of Abruzzo. Maiella is Italy’s equivalent of the Cairngorms, but at a much higher altitude. It’s a huge plateau of multiple summits linked by broad ridges, and divided by deep, mouth-watering gorges. Behind Gran Sasso, it contains the highest peaks in the Apennines, but there are many more of them. 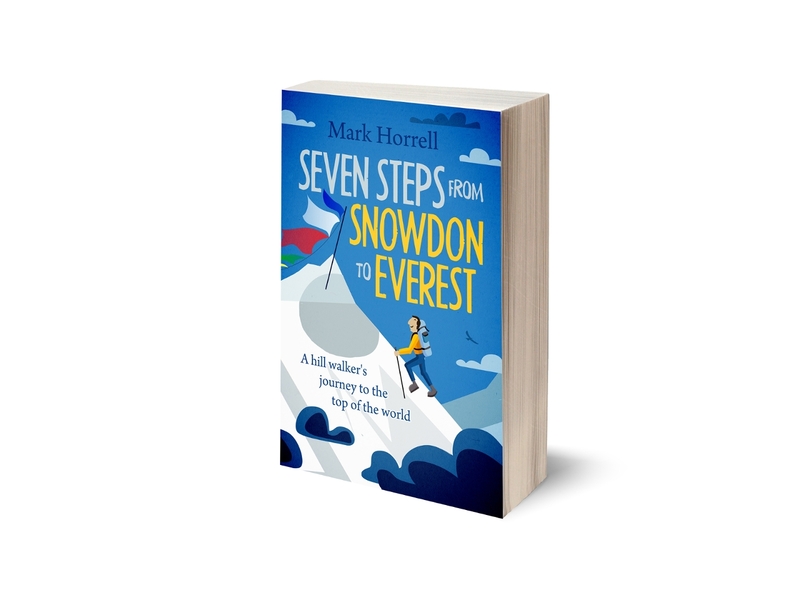 You can walk for miles without dropping below 2,000m, and when you do drop, you drop a long way. The Maiella massif is a prominent feature to the east from many of the peaks in the Central Apennines. It appears as a giant tableland, and because of its superior altitude, it is often still snow-capped when surrounding peaks are snow-free. 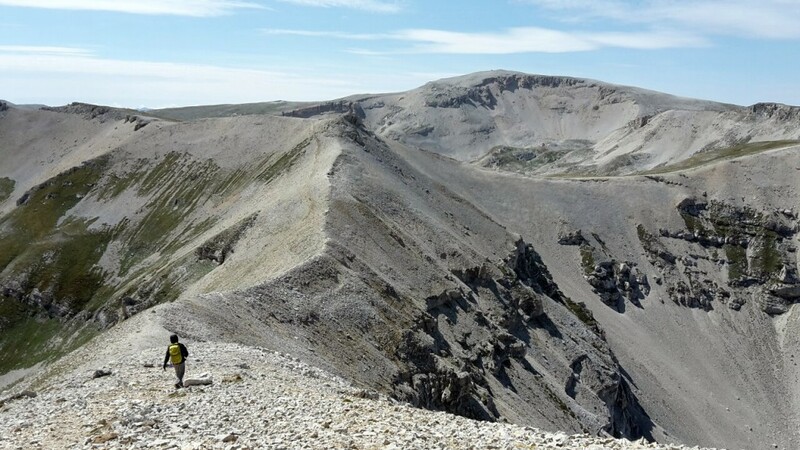 Above 2,500m the ridges and summits of this plateau feel like the surface of the Moon, with mile upon mile of ash-grey limestone shattered into small rocks and pebbles like endless ridges of scree. Between 1,500 and 2,500m large areas of ridge-side are covered in a species of dwarf pine that gives off green dust in spores. 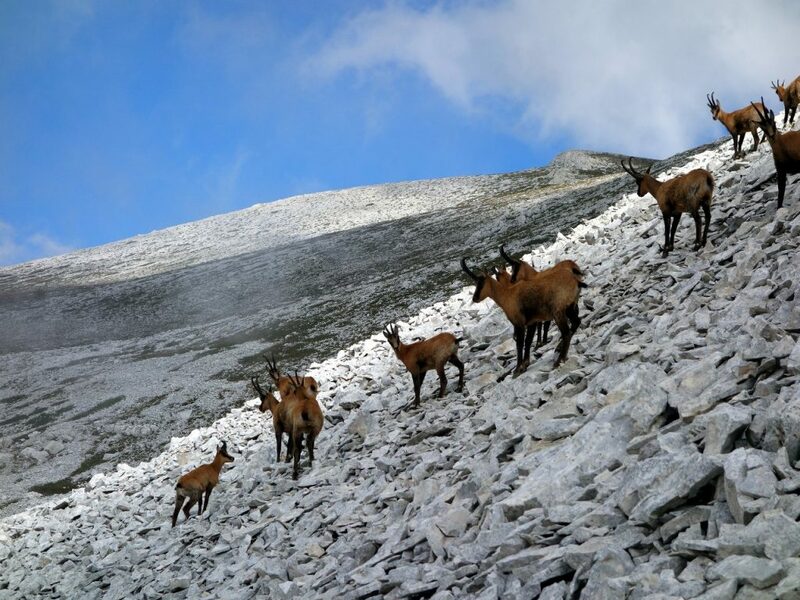 Camosci (chamois) live in these areas in great numbers. I have seen large herds of them in the more precipitous places, and there is often evidence of their presence when clouds of pine dust rise from the forest. 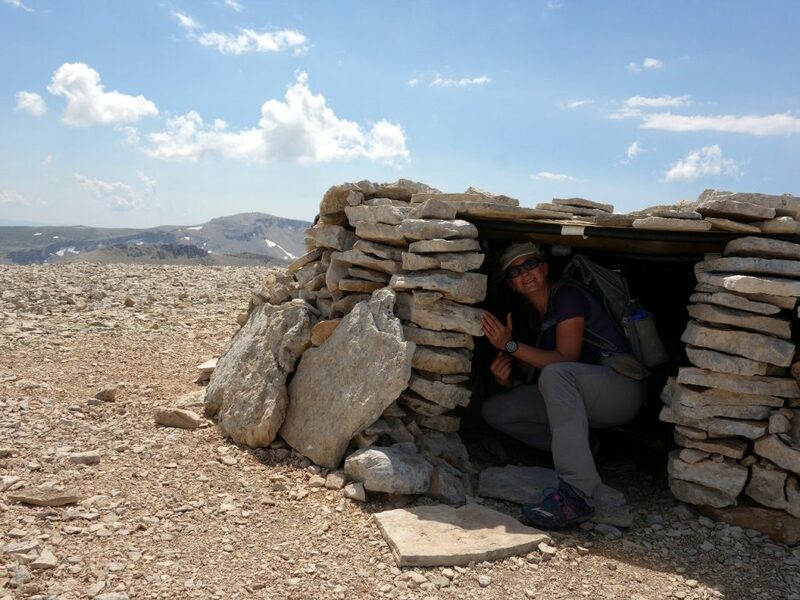 Maiella’s two highest summits, Monte Amaro (2,793m) and Monte Acquaviva (2,737m), the second and third-highest mountains in the Apennines, both have summit shelters for those keen to spend a night up high. In keeping with its moon-like nature, Monte Amaro’s shelter is half a giant red golf ball, resembling an early warning system, and can be seen from miles away. In contrast, Monte Acquaviva’s shelter is more of a home-made job that only sleeps a couple of people and looks like it’s been cobbled together from summit rocks. There is another mountain shelter, Bivacco Fusco, on a nearby hillside for those who prefer more privacy. The reason for this profusion of shelters on mountaintops may well be because of their inaccessibility. The Maiella plateau rises so high above the surrounding landscape that many of the approach routes involve ascents of up to 2,000m. It’s not practical to get up and down them in a single day unless you’re a hill-walking monster. 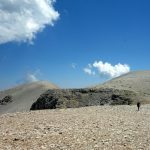 Once up on the plateau, however, many 2,500m peaks rise in close proximity, and it’s possible to bag several in one go. The one easy way of accessing the plateau is via the ski resort of La Maielletta on the northern side of the massif. Here the road climbs to 1,850m, where there is a mountain hut, Rifugio Bruno Pomilio, run by the Club Alpino Italiano (CAI). If you’re one of those mad cyclists who likes pedalling up big hills, this road continues past a barrier and along a ridge all the way up to 2,000m beneath the summit of Blockhaus (2,142m). The road has sometimes been used for the end of a stage in the Giro d’Italia, and what a view there is from up there. 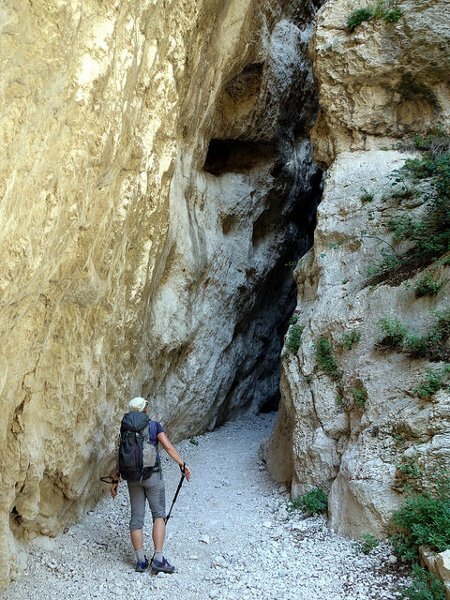 Below the plateau, the Maiella massif is full of deep, narrow gorges. Two of the most impressive are the Valle dell’Orfento to the north and the San Spirito to the east. The latter narrows to – and I’m not kidding – two metres at its bottom end, in a pair of giant cliff faces that look like they are leaning over to touch each other. 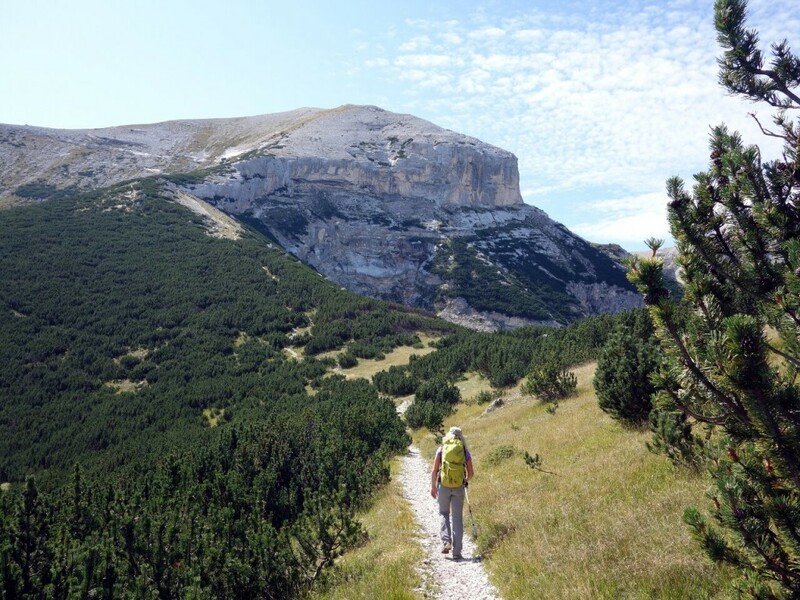 Maiella has an isolated sister peak on its western side called Monte Morrone. 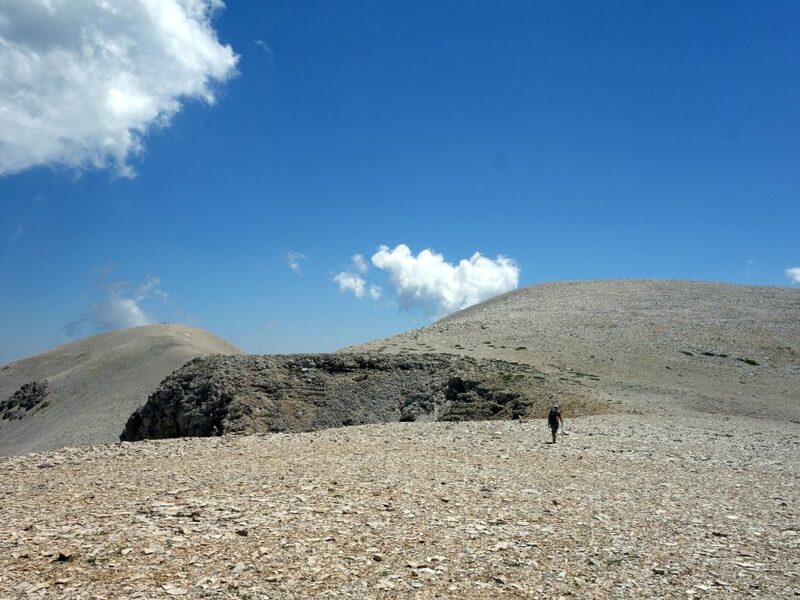 This gentle grassy ridge running north to south rises to only 2,061m. 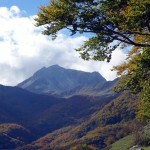 It offers pleasant hiking among beech forest and grassy hillsides, and is a nice contrast to the main massif. 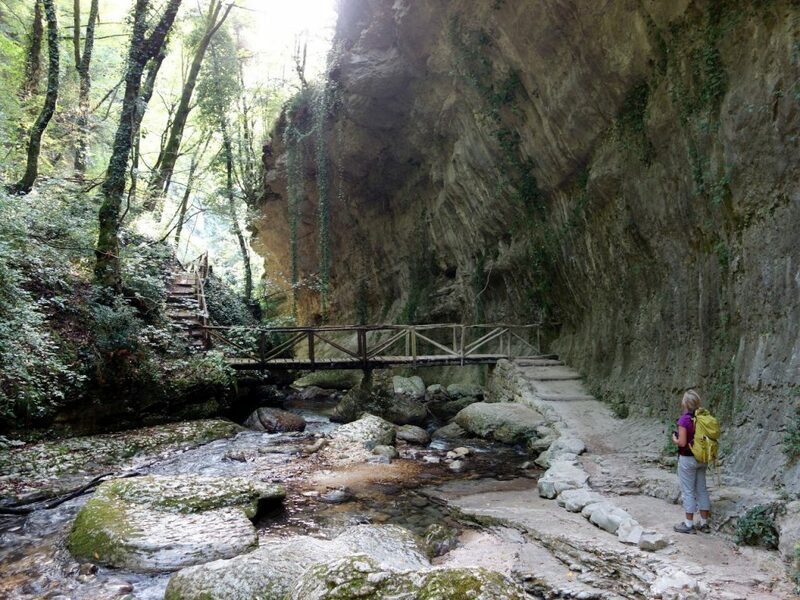 Park up at La Maielletta and follow the long trail to Monte Amaro, the second-highest mountain in the Apennines. The route starts off on grass slopes alongside the road to Blockhaus. Beyond Blockhaus it’s a pleasant ridgetop pathway among pine thickets, before the steep haul up to the plateau. Once up on the plateau you will get a good feel for the connecting peaks and ridges. This is a long day, and not many people hike all the way to Monte Amaro. 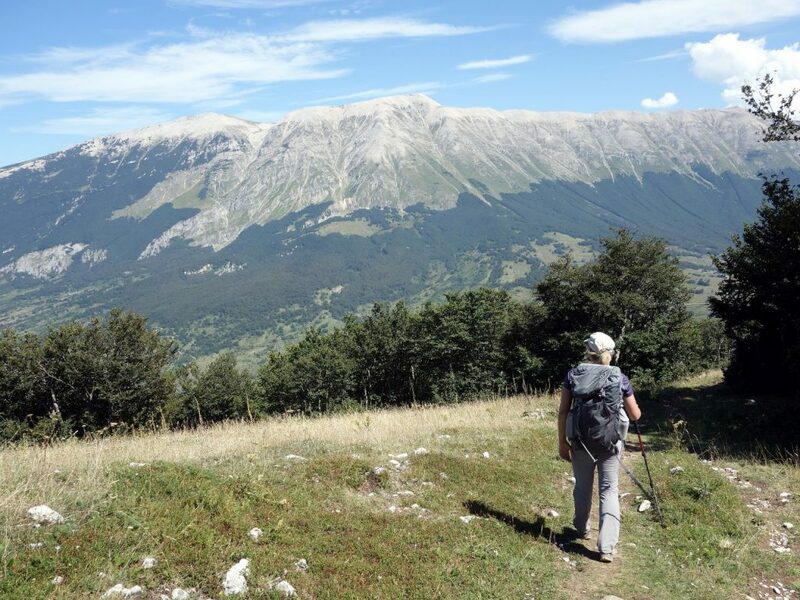 You will find the trail much quieter beyond Monte Focalone as you continue up and over passes and ridges. It’s a real roof-of-the-world hike, with Monte Amaro and most of your route always visible from every point. 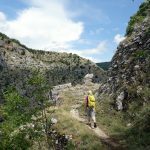 If you don’t fancy hiking all the way to Monte Amaro and back, you can do what most other people do, and hike the shorter version to Monte Acquaviva, by turning left at Monte Focalone. It’s essentially the same walk over the same lunar terrain, but there’s less of it. For a low-level hike, the Orfento valley is very pleasant. Its bottom end, near the health spas of Caramanico Terme, has a Tolkienesque Middle-Earth feel. I challenge anyone to climb Monte Acquaviva from Fara San Martino on the eastern side. It’s an overnight job. You can either bivy in a cave at Grotta Callarelli, about 1,000m up, or in Monte Acquaviva’s summit shelter. A word of warning though. I’ve not tried this method myself, and I don’t know if it’s even possible. I did try to do this as a day hike, but its 2,300m of ascent from Fara San Martino was way too much. What finally turned us around though, was a tangled barrier of pine bushes on the ridge above Grotta Callarelli. This is marked as a numbered CAI trail on the Edizioni il Lupo map, but try as we might, we couldn’t find a way past it. You can see a few hundred more photos of the Maiella massif in my Maiella Flickr album. Monte Amaro, a mountain worth drinking to. Amaro means bitter in Italian. It is also the name of an alcoholic drink. But the ascent of Monte Amaro is a magnificent skyline walk in a moonlike landscape, and is anything but bitter. Monte Acquaviva: the Maiella massif from both sides. We wanted to climb Monte Acquaviva from the east, but its 2,300m of ascent proved a little too much. The following day we drove up to La Maielletta, climbed it from the other side and looked down on our eastern route. Thank you for the gorgeous pictures and wonderful descriptions. Sitting in flat Kansas, looking at the wonderful landscapes you provide really brightens my day! Thank you for your posts on the Apennines (I always have to check how many Ps and Ns), we are currently travelling north through Italy in our Motorhome and have just spent two weeks in Majella and Gran Sasso. We haven’t managed many summits because of the snow but you provided some inspiration and reminded us that we can always turn back if the conditions aren’t right. When we were walking through the Prati di Tivo mountain biking area today I thought ‘oh yes I remember Mark Horrell’s post about this’ – luckily it’s too early in the season for Mountain Bikers to be out on the trails. Thanks, Becky. 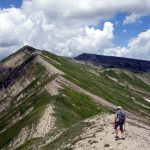 That’s great to hear that you enjoyed the Apennines and these posts provided some inspiration. The Apennines are an amazing place, and part of my purpose is to encourage more people to explore them. I think Prato Selva was the area I mentioned in another post (https://www.markhorrell.com/blog/2016/monte-corvo-crow-mountain/). It’s a former ski resort a little to the west of Prati di Tivo on the northern side of Gran Sasso, which has now been converted into a resort for mountain biking.